Simple 5-3 Elliot Wave Pattern in Nifty Future Hourly Charts we had seen that nifty is currently in making the corrective a,b,c wave with targets 4429 and 4494. I like to further zoom into 15 minute charts of Nifty futures to show how the waves are made. the upward corrective [a,b,c ] can be viewed as 5-3-5 simple elliot wave patterns as shown above with formation of negative divergence pattern. And the pattern if likely to complete today with resistance near 4450-4500 zone as explained in earlier post which also completes the invesrse head and shoulder pattern witnessed in hourly charts. hello,thanka for help.where this charting is available. @ EveryoneLooks ABC wave(hourly).. i.e 5-3-5(15 min) have completed(5-3-5) yesterday itself with 4439 as top. 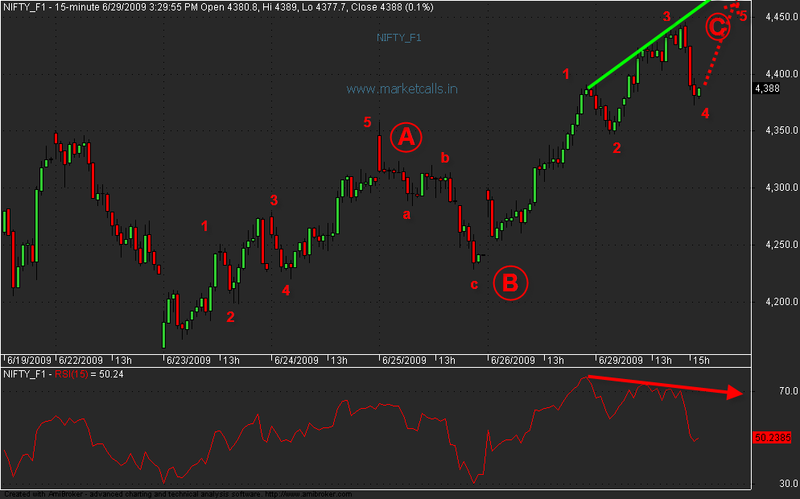 Small correction in charts that 5-3-5 ended yesterday itself with negative divergence. Rashmi its good to book partial profit at this point of time.